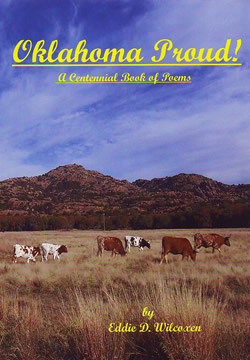 A Book of Poems about Oklahoma - Oklahoma Proud! "Oklahoma, where the wind comes sweeping down the plain." It just sounds poetic! For about thirty years now, southwest Oklahoma has been my home. They say there's no believer like a convert, and I am always ready to sing Oklahoma's praises! I am originally from Kansas, but lived all over the United States before I chose to settle here. My wife Joan came from Long Island, New York to visit her family in Oklahoma each summer for ten years before she decided to move here, where we eventually met. The wonderful solid values and warm and friendly culture of Oklahoma made us each feel at home, so we embraced this as our permanent home together. For all these thirty years, whenever we get the chance, we have been exploring the sights of Oklahoma, from Black Mesa in the far west panhandle to Beaver's Bend in the southeast corner and many parts between. Celebrating Oklahoma's 2007 statehood centennial, I realized that this was the perfect time for a project I had long been planning a book of poems about the events, the people, the places, and the feel of Oklahoma! If you live in Oklahoma, I hope it strikes a chord of truth, and if you don't, I hope it makes you want to visit. Come see us and enjoy the sights, but be forewarned! I came here to visit for a few days, and stayed for thirty years!